The most frequently misapplied verse in the entire Bible. Which verse do you think it is? GIT LYMPHOMAS • Kumar et al. FL ⫽ follicular lymphoma; DLBCL ⫽ diffuse large B-cell lymphoma; MCL ⫽ mantle cell lymphoma; FU ⫽ follow-up. FIGURE 1. (A) Pretreatment 18F-FDG PET scans showing intense 18F-FDG uptake in the region of the cecum and ascending colon. (B) Posttreatment 18F-FDG PET scans showing no abnormal 18F-FDG uptake in the abdomen. PET findings at the original site of disease, 12 remained in remission after a median follow-up of 22 mo (Fig. 1). One of the 13 patients (7.7%) showed relapse at the original site of disease at 11 mo. All 6 patients who had persistent 18F-FDG uptake at the original site of disease on posttreatment 18F-FDG PET scans (100%) relapsed. The median time to recurrence was 8 mo (range, 6 –11 mo). There was a significant difference in disease-free survival (DFS) between patients with positive 18F-FDG PET results and those with negative 18F-FDG PET results (P ⫽ 0.000001). The Kaplan–Meier estimate of the disease-free interval in months is shown in Figure 2. CT was negative for 10 patients, whereas the remaining 9 patients showed persistent disease on posttreatment CT scans obtained within 8 wk after the completion of treatment. Among the 10 patients who had negative CT results at the original site of disease, 9 remained in remission after a median follow-up of 23 mo. One of the 10 patients (10%) showed relapse at the original site of disease at 11 mo. FIGURE 2. Kaplan–Meier estimate of disease-free interval in 13 patients with negative 18F-FDG PET results and 6 patients with positive 18F-FDG PET results. Time intervals are in months. FIGURE 4. Kaplan–Meier estimate of disease-free interval in 10 patients with negative CT results and 9 patients with positive CT results. Time intervals are in months. disease-free interval in months for these patients is shown in Figure 5. There was no statistically significant difference in progression-free survival between patients with negative 18F-FDG PET results and those with negative CT results (P ⫽ 0.8). FIGURE 3. (A) Pretreatment 18F-FDG PET scans showing intense irregular 18F-FDG uptake in bowel loops. (B) Posttreatment 18F-FDG PET scans showing no abnormal 18F-FDG uptake in the abdomen. (C) Pretreatment pelvic CT scan of same patient showing irregular wall thickening of small bowel loops (arrow). (C) Posttreatment pelvic CT scan still showing irregular wall thickening of small bowel loops (arrow) suggestive of residual disease, even though 18F-FDG PET scans appeared normal. FIGURE 5. Kaplan–Meier estimate of disease-free interval in 6 patients with positive PET results and 9 patients with positive CT results. Time intervals are in months. parison with computed tomography and gallium-67 single photon emission computed tomography. Clin Lymphoma. 2000;1:67–74. Spaepen K, Stroobants S, Verhoef G, Mortelmans L. Positron emission tomography with [18F]FDG for therapy response monitoring in lymphoma patients. Eur J Nucl Med Mol Imaging. 2003;30(suppl 1):S97–S105. Ullerich H, Franzius CH, Domagk D, et al. 18F-Fluorodeoxyglucose PET in a patient with primary small bowel lymphoma: the only sensitive method of imaging. Am J Gastroenterol. 2001;96:2497–2499. Hoffmann M, Vogelsang H, Kletter K, Zettinig G, Chott A, Raderer M. 18Ffluoro-deoxy-glucose positron emission tomography (18F-FDG-PET) for assessment of enteropathy-type T cell lymphoma. Gut. 2003;52:347–351. Levine MS, Rubesin SE, Pantongrag-Brown L, Buck JL, Herlinger H. NonHodgkin’s lymphoma of the gastrointestinal tract: radiographic findings. AJR. 1997;168:165–172. Becherer A, Jaeger U, Szabo M, Kletter K. Prognostic value of FDG-PET in malignant lymphoma. Q J Nucl Med. 2003;47:14 –21. Van Den Bossche B, Lambert B, De Winter F, et al. 18FDG PET versus high-dose 67Ga scintigraphy for restaging and treatment follow-up of lymphoma patients. Nucl Med Commun. 2002;23:1079 –1083. Friedberg JW, Chengazi V. PET scans in the staging of lymphoma: current status. Oncologist. 2003;8:438 – 447. Romer W, Schwaiger M. Positron emission tomography in diagnosis and therapy monitoring of patients with lymphoma. Clin Positron Imaging. 1998;1:101–110. Reske SN. PET and restaging of malignant lymphoma including residual masses and relapse. Eur J Nucl Med Mol Imaging. 2003;30(suppl 1):S89 –S96. 23. Guay C, Lepine M, Verreault J, Benard F. Prognostic value of PET using 18F-FDG in Hodgkin’s disease for posttreatment evaluation. J Nucl Med. 2003; 44:1225–1231. 24. Cremerius U, Fabry U, Kroll U, et al. Clinical value of FDG PET for therapy monitoring of malignant lymphoma: results of a retrospective study in 72 patients. Nuklearmedizin. 1999;38:24 –30. 25. Moog F, Bangerter M, Diederichs CG, et al. Extranodal malignant lymphoma: detection with FDG PET versus CT. Radiology. 1998;206:475– 481. 26. Golder W. Positron emission tomography and lymphoma therapy. Onkologie. 2001;24:496 – 498. 27. O’Doherty MJ, Macdonald EA, Barrington SF, Mikhaeel NG, Schey S. Positron emission tomography in the management of lymphomas. Clin Oncol (R Coll Radiol). 2002;14:415– 426. 28. Sam JW, Levine MS, Farner MC, Schuster SJ, Alavi A. Detection of small bowel involvement by mantle cell lymphoma on F-18 FDG positron emission tomography. Clin Nucl Med. 2002;27:330 –333. 29. Hoffmann M, Chott A, Puspok A, Jager U, Kletter K, Raderer M. 18F-fluorodeoxyglucose positron emission tomography (18F-FDG-PET) does not visualize follicular lymphoma of the duodenum. Ann Hematol. 2003;83:276 –278. 30. Hoffmann M, Kletter K, Diemling M, et al. Positron emission tomography with fluorine-18 –2-fluoro-2-deoxy-D-glucose (F18-FDG) does not visualize extranodal B-cell lymphoma of the mucosa-associated lymphoid tissue (MALT)-type. Ann Oncol. 1999;10:1185–1189. 31. Rodriguez M, Ahlstrom H, Sundin A, et al. [18F]FDG PET in gastric nonHodgkin’s lymphoma. Acta Oncol. 1997;36:577–584. Errata In the article “The Role of 18F-FDG PET in Staging and Early Prediction of Response to Therapy of Recurrent Gastrointestinal Stromal Tumors,” by Gayed et al. (J Nucl Med. 2004;45:17–21), Tables 1 and 2 contain errors. In Table 1, the column headers “CT” and “FDG PET” should have been transposed, and in Table 2, the number of false-negative FDG PET findings should have been reported as 24, not 25. The authors regret the errors. Because of a proofreading oversight, the book review “IAEA Quality Control Atlas for Scintillation Camera Systems,” by William D. Erwin (J Nucl Med. 2004;45:1792) failed to name the author of the book, Ellinor Busemann Sokole, PhD, of Academic Medical Center, Amsterdam, The Netherlands. We regret the error. 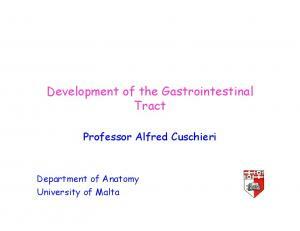 Report "The gastrointestinal tract (GIT) is the most frequently"